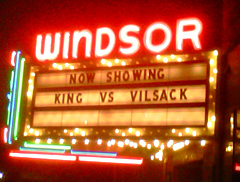 Theater marquee highlights debate between Republican Congressman Steve King and Democrat challenger Christie Vilsack. A deep disagreement over voting and lack of progress on the Farm Bill were the hallmarks of tonight’s debate between Republican Congressman Steve King and Christie Vilsack, his Democratic challenger. The two candidates appeared together at a forum in Hampton and King said it’s time to not only require a photo I.D. for voting, but for election officials all over the country to check the voter registration lists for non-citizens. “There’s no reason for anybody to defend anything else because there’s voter fraud that’s determining these elections and it’s got to stop,” King said, getting cheers and whistles from his supporters in the audience. Vilsack expressed reservations about requiring a photo I.D. Vilsack did not directly address King’s comment about non-citizens casting ballots, but she did speak to his assertion there is voter fraud. King was given a minute to offer a rebuttal. “I heard that, ‘We should do all we can to encourage every person to vote.’ I don’t agree. I completely don’t agree. I think they should be citizens of the United States of America in order to cast a ballot,” King said. According to King, voter fraud is “real” and if it’s not addressed, he said it will change the “destiny” of the U.S.
Late in the hour-long event the subject of the Farm Bill was raised by the debate’s moderator. Throughout the debate King accused Vilsack of lobbing “baseless charges” his way and he used part of his time to periodically announce a running tally through the debate. He also attacked the way Vilsack’s husband, former Iowa Governor Tom Vilsack, is running the U.S.D.A., mentioning a “Meatless Monday” idea unsuccessfully floated by an agency employee.